The following is my submission for POST's All You Can Eat exhibition, held Oct. 30 - 31 at the Sculpture Center in East Cleveland. The idea was to utilize vacant land in the City of Cleveland in some (any) way, to presumably make this a better city. 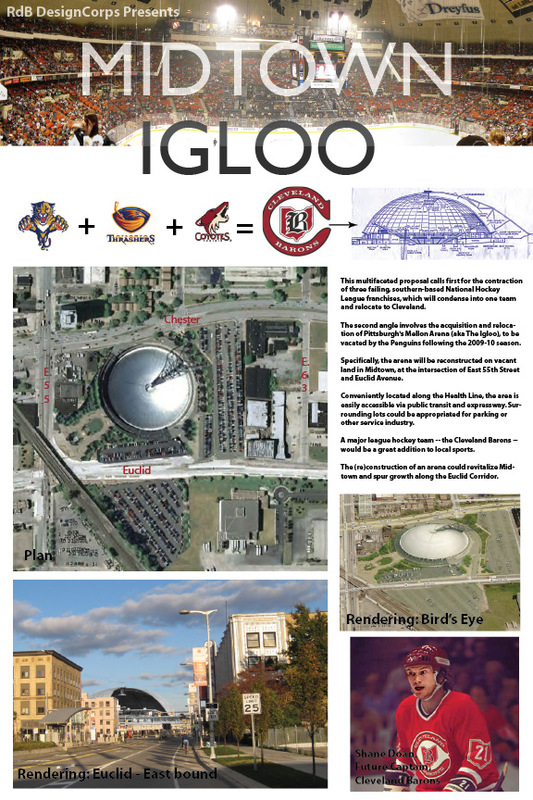 Thus, I proposed moving a piece of Pittsburgh to Midtown -- the MIDTOWN IGLOO. This proposal suggests relocating three failing, Southern-based NHL teams to Cleveland. The franchises with the lowest attendance, and most dire financial straits -- Phoenix Coyotes, Florida Panthers, and Atlanta Thrashers -- will contract into one team, the Cleveland Barons. These teams have had limited playoff experience, and as such, would have the least impact on their respective fanbases should they relocate. The second aspect of this proposal sees the site of a new arena to fall at the intersection of E. 55 and Euclid. Located along the new Health Line public transit system, the area of Midtown is easily accessible via public transit and Interstate and heretofore underutilized. The proposed location stretches north from E. 55 and Euclid to E 55 and Chester, and East to E. 61. The real estate is currently vacant and abated, save some service business located at the Northwest corner of the site. As the City of Cleveland cannot realistically afford construction costs of a totally new arena, an existing one, soon to be discarded, can be acquired and repurposed for the Barons. The Mellon Arena (fka Civic Arena) in Pittsburgh is slated for demolition following completion of the Penguins' new arena. An architecturally unique structure, with a stainless steel retractable dome, the Mellon Arena has seen 42 years worth of NHL games and three Stanley Cup Championships. Aesthetically, the interior lacks certain amenities of its contemporaries and is extremely industrial, with exposed utility systems and narrow concrete concourses. It is a perfect fit for Cleveland. The arena has been repurposed in the past, having initially served as a venue for the Pittsburgh Civic Light Opera. The retractable dome makes it an appealing venue for concerts, or potentially for open air hockey games in the winter time. A professional hockey team and arena could greatly benefit Midtown, as much of the new development on the Euclid Corridor in that area has yet to be occupied. The possibility exists for a variety of bars, restaurants, retail and surface parking. Easy links via the Health Line to University Circle and downtown, along with Cleveland State and Case Western make it all the more appealing of a location. The NHL would also benefit in that it is adding a market that has the potential to grow the game. Instant rivalries would be established with Columbus, Pittsburgh, Detroit and Buffalo. A new arena could be the anchor tenant to shore up Midtown development.